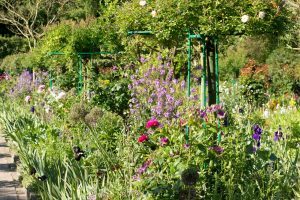 Best Time To Visit Monet’s Garden – Find Out Here! Any fan of beautiful gardens should pay a visit to Claude Monet’s Garden in Giverny, France. The Gardens are home to the artist’s house, the gorgeous flower gardens and also the famous water lily pond that Claude Monet painted so often. Monet fell in love with Giverny when he caught a glimpse as his train passed by in 1883 and chose this idyllic spot to live for 43 years. You can understand why on your magical visit! Let us guide you through the perfect time to visit Monet’s garden. Monet’s house and garden are situated in Giverny, a small village just outside Vernon, about an hour’s drive from Paris. Vernon is located on the Seine and is frequented by river cruise boats therefore if you can’t spare a full day to go to Giverny, a shorter excursion from your river cruise could be an option. Alternatively, it’s an easy drive from Paris and takes an hour by car or if you are pressed for time or just prefer being taken care of then there are many tour companies that offer half day tours from Paris. If you do drive, remember to pre-book your tickets so save time and avoid queues. You can’t miss the beautiful flower garden in front of Monet’s House. According to the garden’s experts if you want to catch the best flowers then the best time for you to visit is from April to October and therefore July is the best month to see the gardens at their best. However, beware that this will also be peak season and so book ahead. Although it may be busy, you can look forward to an explosion of coloured flowers and greenery and the garden will simply be amazing in full bloom. Small paths line the flower beds allowing you to meander through the garden and get up close to the amazing colours and smells. As stunning as the gardens are, everyone (including Monet) is drawn to the area because of the surreal water lilies and the scenic Japanese bridge. After all, these lilies are what made Monet famous. You can find his work in the Musee d’Orsay and Musee de l’Orangie which together hold an incredible collection of Monet’s water lily works. 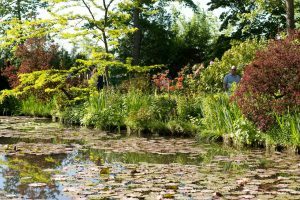 If you want to catch the lilies in full bloom, July and August are water lily season in Giverny. Speaking of bridges, even if you can’t make (or afford) the summer season, the green bridge, surrounded by weeping willows and bright flowers, is one of the most beautiful places in the gardens and one of the few things you can appreciate all year round. Another structure you can experience all year round is of course Monet’s Giverny house. The furniture is still sat exactly the same as it was then. The house consists of his bedroom, a sitting room, a pantry, Monet’s first studio, his kitchen and a dining room. Monet selected all the colours within the house and also the bright mixture of yellows and blues are an amazing reflection of his vibrant tastes. Allow at least 1 hour to visit the gardens and the house. By Train: Take the train from Gare Saint-Lazare to Vernon and, from there, a bus leaves for Monet’s Gardens in Giverny. The train takes approximately 45 minutes and the bus a further 15 minutes. It is also doable to get a taxi from the train station. Train schedules are available on the SNCF website. By Car: Drive from central Paris to Giverny. The journey will take around 1 hour. Parking was offered close to the entrance of Monet’s Gardens. Buy your ticket online before you go. Tickets purchased online are often used any day and it means that you don’t need to line up at the entrance to buy your ticket. 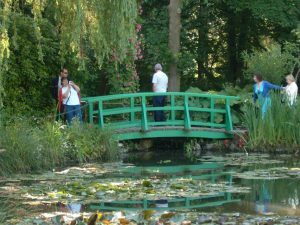 Entry is €10.20 per adult/senior and includes access to both gardens and Monet’s house. (2018 prices) Children and students cost €7.20. Children under 7 are free of charge. An e-Ticket management fee of €1.45 per order applies. Online tickets are not sold for the same day. The house and garden are open from late March to November 1 each year from 9.30am to 6.00pm (last entry is at 5.30pm). 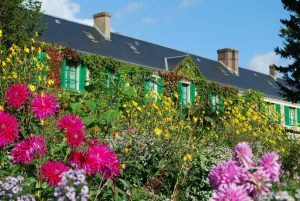 Monet’s Garden are one of the most beautiful places in France. It’s definitely worth the trip. You might even be inspired to take up Monet’s craft. The best time to go would be in July to avoid crowds, ensure you pre-book and you visit in the early morning or just before closing time.